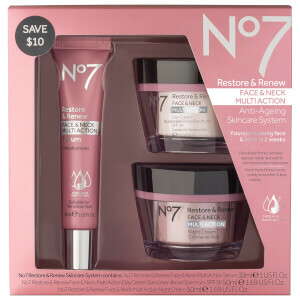 Help skin to look and feel its best with the Boots No7 Restore & Renew Face & Neck Serum; No7’s first multi-action serum that delivers clinically-proven results for both the face and neck. As we age, the face and neck are vulnerable to signs of ageing, the delicate skin is fragile and is therefore prone to loss of elasticity and uneven texture. Effortlessly smoothing over the face and neck, the fast-absorbed formula envelops skin in a concentrated veil of anti-ageing ingredients. The serum is powered by an array of intelligent complexes used in the brand’s coveted Protect and Perfect range, including a firming, anti-wrinkle and lightening complex. Fine lines and wrinkles are reduced, both the face and neck are visibly firmer and more lifted, and skin appears even and uniform. From the first use skin feels enviably smooth, and with continued use the area appears visibly younger and revitalised. Use morning and evening after cleansing. Smooth into your face and neck until fully absorbed, then moisture with Restore & Renew day or night cream. Aqua (Water), Dimethicone, Glycerin, Butylene glycol, Aluminum starch octenylsuccinate, Isononyl isononanoate, Gluconolactone, Dimethicone crosspolymer, Cetearyl alcohol, Ammonium acryloyldimethyltaurate/VP copolymer, Phenoxyethanol, 3-O-ethyl ascorbic acid, Pentylene glycol, Polysorbate 20, Potassium hydroxide, Xanthan gum, Dimethiconol, Hibiscus abelmoschus extract, Parfum (Fragrance), Sodium hyaluronate, Retinyl palmitate, Caprylyl glycol, Propylene glycol, Tocopheryl acetate, Sorbitan laurate, Hydrolyzed rice protein, Ethylhexylglycerin, Carbomer, Sodium lauroyl lactylate, Phyllanthus emblica fruit extract, Calcium hydroxymethionine, 3-Aminopropane sulfonic acid, Dipropylene glycol, Hydroxyethylcellulose, Tetrasodium EDTA, T-butyl alcohol, Sophora angustifolia root extract, Hydroxypropyl cyclodextrin, Panax ginseng root extract, Acetyl dipeptide-1 cetyl ester, Ceramide 3, Morus alba leaf extract, Sodium benzoate, Phytosphingosine, Ceramide 6 II, Cholesterol, Tocopherol, Palmitoyl tripeptide-1, Palmitoyl tetrapeptide-7, Ceramide 1.